LAKEFRONT BEAUTY! 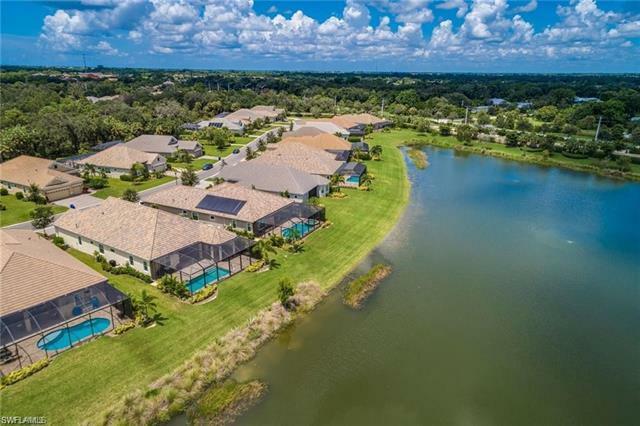 Why wait to build when you can move right into your Florida dream home NOW!? 3 Bedrooms Plus a Den/Office, 2.5 baths with almost 2, 500 sq.ft. of luxury living area. Features a wide open great room with soaring ceilings, custom accents galore, rare to find NATURAL GAS community. Upgrades include: crown molding, coffered ceiling, hurricane protection, extra insulation in walls for sound control. Very large master suite with luxury bathroom. Covered lanai has picture window screen with water views galore. The outdoor living space is perfect for entertaining. All within a smaller, boutique gated and secured, LOW HOA fee single family neighborhood offering a natural wooded walking path and No CDD! Amenities at Estero Place include a nature boardwalk and direct access to the Three Oaks Bike Path. LOCATION, LOCATION... short distance from I-75, RSW, Miromar Outlets, Coconut Point, shopping, dining, beaches, parks, and so much more. Professional pictures coming soon.